The Hobbit The Battle of the Five Armies Poster: Bilbo Brings the Sting! We’re probably due for a fresh The Hobbit: The Battle of the Five Armies trailer -- what with the film landing in a few months (December 17) and we’ve only really gotten one. But, until then, we have this little gem that arrived from Warner Bros. in the form of a character poster for Martin Freeman’s Bilbo. And we love it all the more because he’s sporting his sword, known as Sting. Yes, it’s bloody brilliant! Bilbo and his band of warriors (including Ian McKellen returning as Gandalf) march towards an end to The Hobbit trilogy from Peter Jackson. Watch The Hobbit: An Unexpected Journey online to see how it started and you’ll be ready to watch The Hobbit: The Desolation of Smaug online and be sufficiently set for the December release that closes Jackson’s trilogy. The Hobbit: The Battle of the Five Armies features a stellar cast. 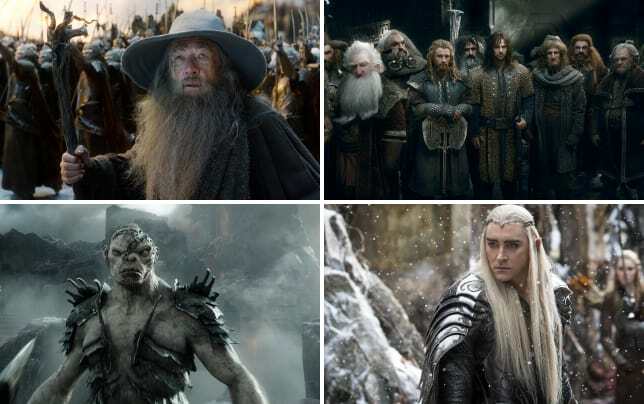 Beyond Freeman and McKellen, Jackson’s epic conclusion features Luke Evans, Richard Armitage, Evangeline Lilly, Lee Pace, Benedict Cumberbatch, Stephen Fry, Cate Blanchett, Ian Holm, Christopher Lee, Billy Connolly, Hugo Weaving and Orlando Bloom.